How Do Termites Enter Your House? Happy New Year from the Ray Pest Control team! Now that the holidays are over, you’re probably settling back into a normal routine. You might also be making your list of New Year’s resolutions that you hope to achieve in the new year. As you make your list, you should consider the ways in which you can better protect your home from pests in 2019. While the bugs and creepy crawlies are not as active in the winter as the will be in a few short months, there’s nothing wrong with getting a jump on pest prevention. 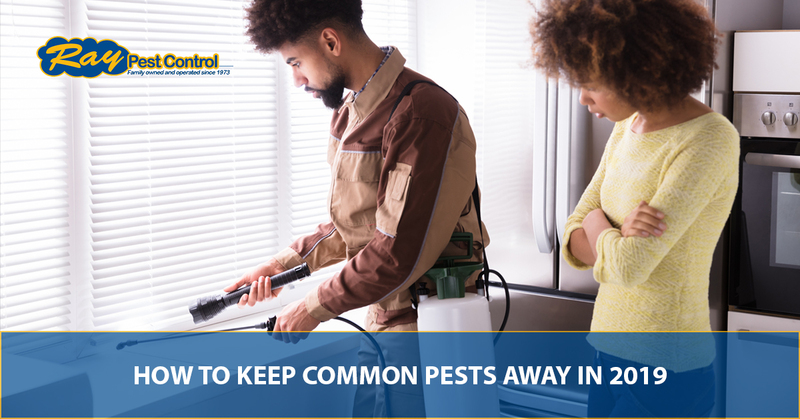 Today, your Top Rated Local® pest control company in Piedmont will share a few helpful hints and tricks for preventing pests from invading your home. Should you have a pest problem, be it bed bugs, spiders, ants, or the furry pests like mice, rats, raccoons, and others, Ray Pest Control is just a call or a click away. Clutter is a pest’s best friend. Unfortunately, it’s after the holidays when clutter can really buildup. The New Year is an opportune time to clean up clutter, give away old home goods rather than stacking them in the garage, and finally get rid of those boxes you’ve had stored in the basement since you moved last summer. Getting a jump on removing clutter from the home can make spring cleaning a breeze, and reduces the potential hiding places for bugs, rodents, and other unwelcome guests. One of the best defenses against invading pests is sealing off any potential entryways they can use to get into your home. For those year-round pests likes mice and rats that will constantly seek our shelter and warmth, it’s essential to block them from your home. Remember, a mouse can fit through a hole the size of a dime! Walk around your home to identify holes, gaps, or openings where pests and rodents could enter your home. Key areas to inspect might include openings for pipes and electrical wires, as well as doors, windows, and the foundation. Use caulk, cement, or copper mesh to seal and plug up openings. Be sure to repair damaged screens on windows and doors, and seal off windows with weather stripping for additional protection. Fireplaces are an efficient and cost-effective method for heating the home, but stacks of firewood can also harbor pests and rodents of all kinds. A good rule of thumb is to store stacks of firewood at least 15-20 feet away from the house. It’s also a good idea to elevate the wood about five inches off of the ground. Be mindful when bringing wood into the home by banging the wood against something to knock off any pests or rodents hiding in or clinging onto the wood. Pests love moisture, which is why they’re often drawn to basements, crawlspaces, and attics. Inspect these areas for signs of plumbing leaks or a buildup of condensation. Repair bad pipes and dry out any areas where moisture and dampness are prevalent. Make sure these areas can be properly ventilated to ensure they stay dry. Inspect the exterior of your home for damage, including the roof, fascia, and shingles. Pests, rodents, and wildlife of all types can find their way into the attic through damaged shingles, shotty or damaged roof ventilation systems, chimneys, damaged fascia, and more. Make any necessary repairs or call in the experts for pest prevention. Doing so before springtime can help reduce the risk of animals like birds, squirrels, and raccoons turning your attic into a nest for their young. These are just a few ways you can keep pests and rodents out of your home ahead of spring. If you’ve done everything in your ability to safeguard your home from pests of all kinds and they still manage to invade your home, it’s time to take things to the next level. At Ray Pest Control, we offer general pest control services, bed bug removal, animal control, wildlife removal, and so much more. Our top priority is ensuring your health and the health and safety of your loved ones and pets. Our full-service pest control company is backed by an A-plus Better Business Bureau (BBB) rating, nearly 50 years of experience, and an average rating of almost 99 percent on Top Rated Local®. If you have a pest problem, we have the solution. Find out why we’re Piedmont’s favorite pest and wildlife control company and call or click for a free quote. You can even click to view our specials. Check back for more helpful hints and DIY pest prevention tips and be sure to call us with any questions you have! Until next time, thanks for reading!